February 12, 2014 | Bill V.
There is something a tiny bit voyeuristic in reading the messages on old postcards. Last year I wrote a detailed blog post on vintage Valentine's Day postcards in the Toronto Public Library collection - showing two of my all time favorites - "My Heart Pants for You" and "Love in a Sausage". This year I share one charming image and one image with an interesting Toronto connection. Below is a vibrantly colored postcard showing two children dressed as clowns or stock characters of pantomine and Commedia dell'Arte. International Art Publishing Co. Ltd. (1895-1914) New York, NY In 1895 Wolf & Co. and the Art Lithographic Publishing Co. founded this subsidiary (International Art Publishing Co.) to take over production of their holiday and souvenir cards. Samuel Garre, the manager of the Art Lithographic Publishing Company assumed management of this new entity. They would grow into an important publisher of artist signed cards, which were printed in Germany." They also handily show us the clear mark for the company. More disturbing is the card below mailed February 1910. A woman in the centre of a spider's net dangling a man on a string - is she the cliche woman ensnaring a man? An odd card to mail to someone - especially to a young woman. Anonymous, we can only imagine was it sent by her beau or by a friend as a joke? It was kept though, so I like to think it was meant well. It was produced by the company P. Sanders of New York is done in low relief and includes glitter highlighting the hearts and the figures. The card was mailed to Miss Hazel Pursey of 399 King Street East in Toronto. Using the online Might's Toronto City Directory you can look this address up and in 1912 find Mrs Susan Pursey (widow of Frank) living there with her daughters, Miss Hazel Pursey (student) and Miss Laura Pursey (stenographer with Jose & Withers - Real Estate and Insurance Brokers 30 Victoria Street). The Toronto Reference Library and North York Central Library both provide in library only online access to Ancestry.ca. Using this resource we can look into the 1901 Canadian Census and find that Frank Pursey, Hazel's father, was a druggist and of English background. A Francis J. Pearce married Susan (Beale) on August 5, 1891. The family name seems to change or have spelling variants. Hazel is listed as being born in May 15 1894. By the time of this card it looks like her father has died (see Might's directory above listing Susan as a widow) although there is no firm record of his death. Susan Pursey was born Susan Beale in 1868 and is listed as a daughter of Francis and Mariah Beale. 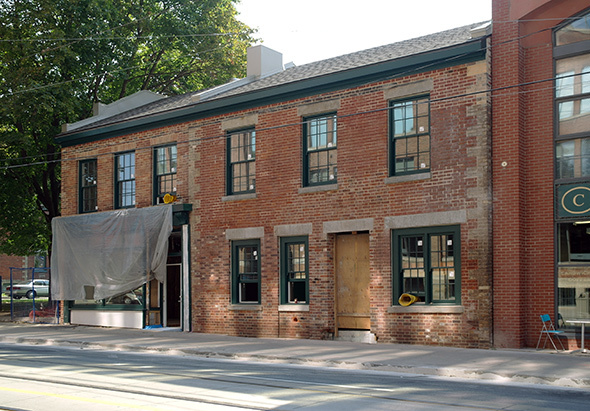 Francis Beale is listed as Irish born and a bricklayer although builder might be more accurate as in fact he built the buildings at 399-401 and also 403 King Street East. In 1901 and circa 1910/1912 Susan (Beale) Pursey is still living in her family's home at 399 King Street East. Hazel Pursey is Francis Beale's granddaughter. In Ancestry Hazel and Susan's last name is listed as Deacy but I think this is a misreading of Pursey and it's been corrected by another user. Still using Ancestry we can discover that at age 28 Hazel Beatrice Pursey married Frank Archibald Hamm, a landscape architect, on June 24 1924. They were both Anglican. Interestingly her sister Laura Pursey marries at age 30 to George William Jose, 39, in 1922. If you recall she worked for the firm Jose & Withers so she either marries her boss or her boss' son. If you're interested in Toronto's local history or genealogy then you'll really like the Toronto City directories digitally available from 1797 to 1899. Having finished with the people what about the history of the actual building at 399 King Street East? Come, gentle reader, let's go on an architectural journey and admire this circa 1932 photo from our digital archive (photographer Dyce Chalmers Saunders). This area of King and Parliament was part of the Corktown, one of Toronto's oldest areas and home to Irish working class settlements and part of the original City of York. This rare Georgian architectural gem is quite discreet and elegant. It was built by Francis Beale circa 1852. To the right is 399 King Street East and to the left is 401 King Street East. They were semi-detached but built as one building and not exactly symmetrical or mirror images although the whole is very balanced. They're built neatly of red brick with yellow brick highlighting the corners decoratively. The window and door lintels are solid stone. 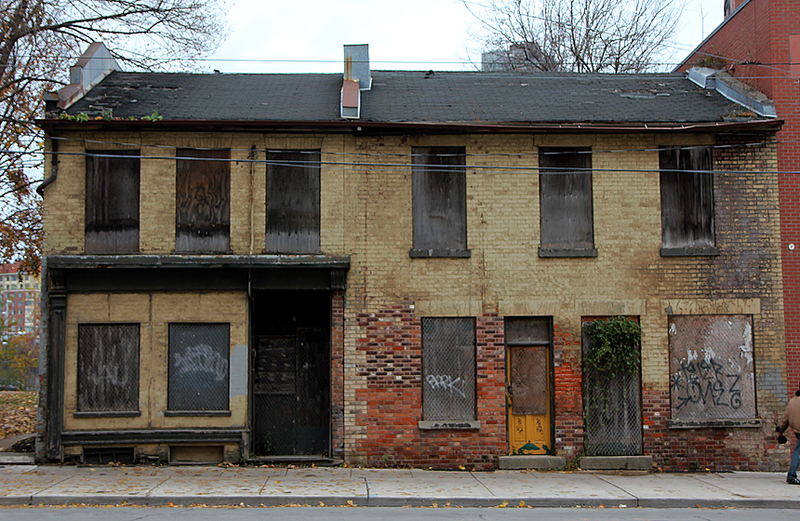 Bricklayer/Builder Francis Beale also later built 403 King Street East - a more substantial single family building. They were originally commercial on the ground floor and residential on the upper floor. Just east of here is Little Trinity Church and Manse. Attached to 399 and due south, was the Derby Tavern (torn down in the 1980s and replaced by condos). These lands are owned by the the Anglican Little Trinity Church Community. In recent times there they were derelict. There were several attempts to demolish the buildings that were repeatedly refused by the City of Toronto. Recently they've been part of a revitalization plan put forward by the Church and in 2014 finally realized. There are extensive historical and architectural notes about the building and also the restoration process in a City of Toronto staff report on it. Here is what they looked like boarded up. There's been extensive writing about this project by blogTO , The Grid, and also Christopher Hume in the Toronto Star. And here is what they look like restored - the facade was kept - but all the rest behind is completely new. They now serve Little Trinity Church as offices, meeting spaces etc - not the residential / commercial use they originally functioned as. photo from blogto - article by Chris Bateman. What would Hazel Pursey, who received the Valentine's card in 1910, or Francis Beale, her grandfather and the original builder, think of what happened to her home? Could she imagine her postcard would be kept, donated to the Library and given a fresh life? I hope she had a good Valentine's Day and I hope you do as well.